The X6 is getting a baby brother! Auto Express has learned that BMW is planning a head-turning smaller version of its coupé-styled SUV – and the newcomer could carry the X4 badge. the recently revealed X3. Codenamed X-Style by BMW insiders, the car would get a very similar appearance to the X6 with a rakish coupé-like roofline and a muscular body. But there’s a twist to the story. Whereas the X6 gets a conventional tailgate, to make the newcomer stand out even more it is likely to benefit from a twin-hatch system, just like the 5-Series Gran Turismo. It will give the X4 an extra level of flexibility, allowing owners to open the entire tailgate or just the saloon-style boot. Inside, there will be a four-seater layout with two individual rear seats, emphasising the X4’s more luxurious positioning within the X range. Under the skin, it would share engines and gearboxes with the X3, so expect a super-efficient 181bhp 2.0-litre turbodiesel for the xDrive20d, capable of 0-60mph in around eight seconds, yet returning 50mpg and emitting just 150g/km of CO2. However, there will also be a range-topping xDrive35i petrol variant featuring a 3.0-litre turbocharged six-cylinder engine with around 300bhp. That would give it enough punch to do 0-60mph in around five seconds and a top speed in excess of 150mph. The X4 has been on the drawing board for a while now, but the project was put on ice as a result of the financial crisis. It is now expected to make an appearance in concept form at a major motor show next year. If the public reception is positive, BMW will put the car into production and sales could start in 2012. That’s not it for new BMW models, though. The firm is also planning to grow its sales with a refreshed 3-Series – also due in 2012 – and a front-wheel-drive version of the 1-Series to compete with Audi’s A1 supermini. The MegaCity electric car range is also imminent. The company will launch its new 6-Series coupé later this year, too. There is room for an X4 in the lineup, yet BMW wont make a 4-door version of the next gen M3? I don't know what to think now that BMW will be only 1 SUV series short of making as many trucks as it does cars. Mini is also getting a X6 version. I consider the GT's to be part of the 3 and 5 series lineup. Just like wagons would be. Also, the GranCoupe is really just a 4-door 6 series, so I lump that in with the 6 series as well. As much as I love Mini, it isn't a BMW, just owned by them. Not to split hairs though. Even if you count all the models you mentioned separately, BMW is still becomming a truck heavy manufacturer. I understand an option or two, but enough is enough, imo. 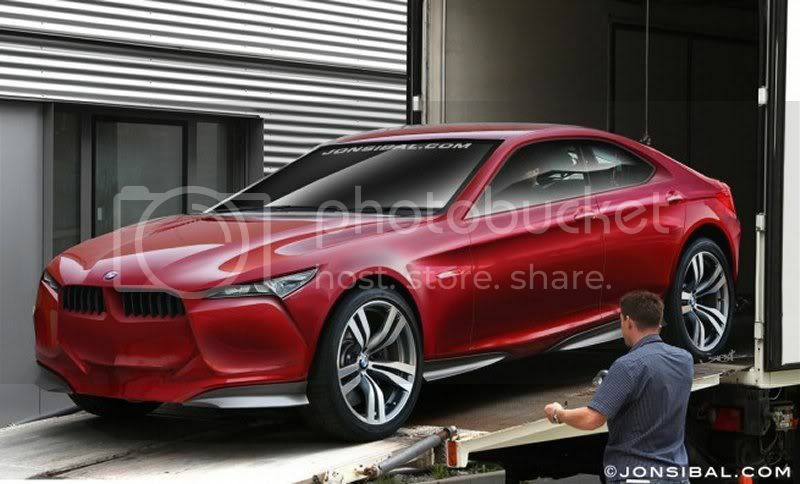 Will we ever see a 335xi vert? It was only natural. With the SUV craze decidedly downsizing, BMW appears set to add an X4--with a range-topping M version--as part of plans to expand its utility-vehicle lineup in 2014. Conceived along the lines of the highly successful X6, the X4 is a smaller and more agile four-seater. Although it shares the same floorpan, drivelines, chassis and engineering hard points as the X3, the X4 is set to receive individual styling in a move to give it a more sporting image and enable BMW to position it higher than the SUV upon which it is based. Those who have seen the latest design proposals suggest the X4 differs from the X3 in much the same way the X6 is removed from the X5, with a bullish front end, curved coupe-style roofline, four doors and heavily angled tailgate. “The design is not finalized, but we know the direction and it will likely surprise,” a source told AutoWeek. As with its larger sibling, the exterior design changes would make it less practical than its more upright sibling, with reductions in headroom and luggage capacity. But strong sales of the X6--it has easily beat sales targets announced at launch in 2008--have convinced BMW bosses that customers are prepared to forego everyday usability in the name of style. BMW's rival to the upcoming small Porsche, expected to be called the Cajun, was first proposed by in-house designers in 2006. However, capacity concerns at Magna's factory in Graz, Austria, where the first-generation X3 was assembled, ultimately led BMW to postpone a decision on its future. Things changed when second-gen X3 production switched to Spartanburg, S.C.
Further investments to the Spartanburg factory have increased its capacity from a previous 160,000 to 240,000, providing the necessary scope for North American production of the future X4. “With the move into North America we're able to take advantage of greater production flexibility,” a high- ranking BMW insider told AutoWeek at the recent Paris motor show. While stopping short of confirming a definitive production approval for the new SUV, AutoWeek's source suggested it had the backing of the company's chief executive, Norbert Reithofer, who is expected to announce its addition to the lineup as part of BMW's plans to sell 2 million cars annually by 2020. While the new X3 is aimed at strong-selling SUVs such as the Audi Q5 and the Mercedes-Benz GLK, the X4 will be targeted directly at the Porsche Cajun and an expected C-segment four-wheel-drive model from Alfa Romeo due in 2012. North American market conditions are heavily influencing BMW's decision to bring the X4 here. The X4 is expected to come with a choice of four- and six-cylinder gasoline and diesel engines mated to a six-speed manual, a seven-speed dual-clutch or an eight- speed automatic gearbox. Like the X3, BMW does not plan a two-wheel-drive option. The X4 will use BMW's latest electronically controlled Dynamic Performance Control system, providing an individual proportioning of power to each rear wheel dependent upon prevailing traction. Sitting at the top of the lineup will be a performance-orientated X4M model boasting styling upgrades, a future twin-turbocharged inline six-cylinder and a seven-speed DCT dual-clutch gearbox from the BMW M division. The X4's double-wishbone (front) and multilink (rear) suspension will be tuned to deliver more engaging handling than the X3, with a lowered ride height, reduced wheel travel, uprated antiroll bars and unique spring and dampers, the latter offering variable control. BMW is planning a sporting version of the second-generation X3 with its own, distinctive look. The car, depicted here in Autocar’s exclusive computer-generated rendering, will extend BMW’s already strong presence within the toughly fought premium SUV market. Smaller and more agile than the X3, the new four-seater is expected to be badged X4 when it goes on sale in 2014. And in keeping with the new four-wheel-drive’s sporting brief, BMW’s plans also call for a range-topping X4 M version, previewed in our rendering. The X4 has been conceived along similar lines to the successful X6, some 112,500 of which have now rolled out of BMW’s Spartanburg factory in North America, placing it well ahead of earlier sales targets. On going investment and expansion at Spartanburg have increased its annual capacity from 160,000 to 240,000, providing the necessary scope for North American production of the future X4. Although the X4 shares the same floorpan, drivelines, chassis and hard points as the X3, it is set to receive its own individual styling in a move intended to give it a more sporting image and enable BMW to position it higher than the SUV upon which it is based. Those who have seen the latest design proposals suggest that the X4 differs from the X3 in much the same way that the X6 is distinguished from the X5, with a bullish front end, curved coupé-style roofline and heavily angled tailgate. “The design is not finalised but we know the direction and it will likely surprise,” said our source. As with its larger sibling, the exterior design changes are set to make it less practical than its more upright sibling, with reductions in headroom and luggage capacity. However, strong sales of the X6 have convinced BMW bosses that customers are prepared to forgo everyday usability in the name of style. The car is also depicted in a pair of official BMW sketches. Although they reveal a three-door model badged X3, they hint strongly at the X4's design, mainly its roofline and front-end styling; BMW sources insist that too much shouldn't be read into the fact it has three doors. BMW’s answer to the Porsche Cajun — Stuttgart’s new three-door SUV, which is due for launch in 2013 — was first proposed by in-house designers back in 2006. However, capacity concerns at Magna in Austria, where the first X3 was made, ultimately led BMW to postpone a decision on the car’s future until production switched to Spartanburg — something that has been realised with the second-generation X3. high-ranking BMW official revealed to Autocar at the recent Paris motor show in direct reference to the X4. While stopping short of confirming a definitive production green light for the new SUV, Autocar’s source suggested it already had the backing of the company’s chief executive, Norbert Reithofer. As well as the Cajun, BMW will level the X4 at the Audi Q5, Saab 94 and yet to be introduced compact four-wheel-drive offering from Alfa Romeo, which is due in 2012 and will form a central role in its plans to return to the US market. Although it is still early days, the X4 is expected to come with a choice of four and six-cylinder petrol and diesel engines mated to a six-speed manual, seven-speed double-clutch or optional eight-speed automatic gearbox. As with the X3, BMW does not plan a two-wheel-drive version. “We’re only considering four-wheel drive,” confirmed one source. It will be allied to BMW’s latest electronically controlled Dynamic Performance Control system, which provides an individual apportioning of drive to each rear wheel dependent upon prevailing traction. Sitting at the top of the line-up will be a performance-orientated X4 M model boasting styling upgrades and a next-generation in-line six-cylinder engine with twin turbochargers from BMW’s M division. The X4’s double-wishbone (front) and multi-link (rear) suspension will be tuned to deliver more engaging handling than the X3. There will be a lowered ride height, reduced wheel travel, uprated anti-roll bars and unique spring and dampers that will feature variable control. My latest AutoWeek mag arrived last weekend and they had an article on the X4. The picture in the mag looked real but was probably CG. Anyways it looked a lot like the picture Lemans posted above except it was two doors. CAN THIS BE THE X4? ^ I think that is a photoshop of an old photoshop.